Located at the southern end of the Las Vegas strip the Mandalay Bay Hotel is both classy and hip. 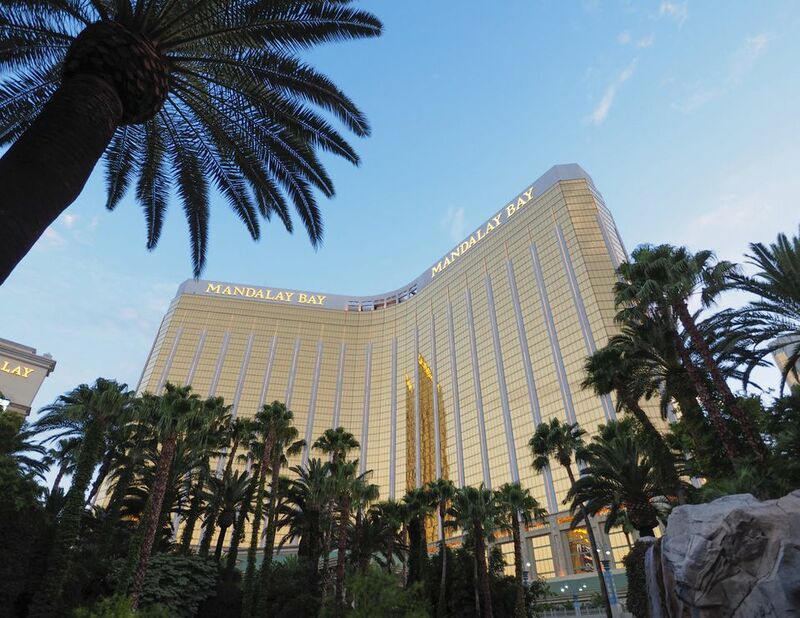 While the Bellagio may boast about high-end everything, the Mandalay Bay has its own type of luxury. If you’re looking for great restaurants, great entertainment, incredible pool, and Las Vegas gaming action in an elegant and upscale location this is it. But a high price tag comes with a luxe hotel. The Mandalay Bay can be a very pricey place to dine but you can go to the food court near the convention center and easily get a sandwich and a drink for under $10. Try the House of Blues for lunch or dinner—the average entrées are between $10 and $15. Citizens Kitchen and Bar has some lower priced entrées as well but the overall bill can add up very fast. Raffle’s Café has some low priced entrées and on a relative scale, it is friendly to the wallet. Walk over to Della's Kitchen at Delano Hotel and they have ample portions that are worthy of sharing. The food is very good so you might be inclined to be a bit greedy with your portions. Also, happy hour menus are quite plentiful in this resort. These restaurants serve up some delicious cuisine while having reasonably priced items on the menu. Some are in the hotel and some in the Mandalay Place Shoppes. At Hussong's Cantina, you don't have to settle for just the chips and salsa and a beer but you could and you would probably be full. Happy hour specials and a simple taco are reasonably priced at this Mexican food spot in the Mandalay Place Shoppes. As with most spots, once you add alcohol, the idea of cheap is gone. The Border Bar and Grill is a vibrant Mexican restaurant overlooking the Lazy River just off Mandalay Beach. With two floors of patio dining, this hip, urban cantina is a great place to sip a margarita and enjoy al Pastor tacos or a bowl of tortilla soup. They offer all-you-can-eat small plates and bottomless mimosas on Saturday and Sunday. Not cheap but you can easily find something inexpensive on the menu. Yes, burgers are cheap but this burger is gourmet style and delicious. A burger here will cost you more than a fast food meal but will be significantly better. The beer list is very impressive so be careful. Burger Bar is located inside the Shoppes at Mandalay Place. If you need a quick slice of pizza or an affordable salad or pasta this spot at Mandalay Place is convenient and fairly quick. Slice of Vegas is open for lunch and dinner and the pizza by the slice counter is good for an after dinner snack. Rí Rá Irish Pub was constructed from a pub meticulously restored in Ireland then shipped to Mandalay Place. Rí Rá the epitome of an Irish pub and offers a lineup of live music, a comprehensive drink list, and pub grub. They have an all-day Irish breakfast and reasonably priced dinner options like fish and chips, Irish cheddar mac, and a selection of gourmet burgers. BBQ Mexicana, a fast-casual eatery from Celebrity Chefs Mary Sue Milliken and Susan Feniger, is located across from Border Grill and adjacent to the Mandalay Bay Convention Center. Enjoy salads, burritos, and bowls filled with Mexican ingredients.